February 26, 2016 ETP Resources announces changes to the ETP Taxonomy® to coincide with today's launch of Eaton Vance's Exchange-Traded Managed Fund Shares. 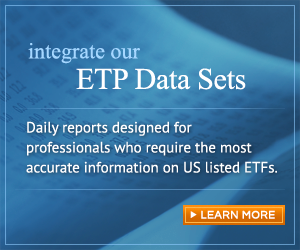 The ETP Directory® is a report published each business day (T+1) that covers U.S.-listed exchange-traded products (“ETPs”) included in the ETP Taxonomy® developed to meet the financial industry's need for an accurate source of information on this dynamic group of securities. ETP Resources provides independent management consulting services to financial services companies, allowing them to gain objective advice and access to specialized expertise in the areas of exchange-traded products development, operations and information technology.